Roedra are electricity-based river serpents. 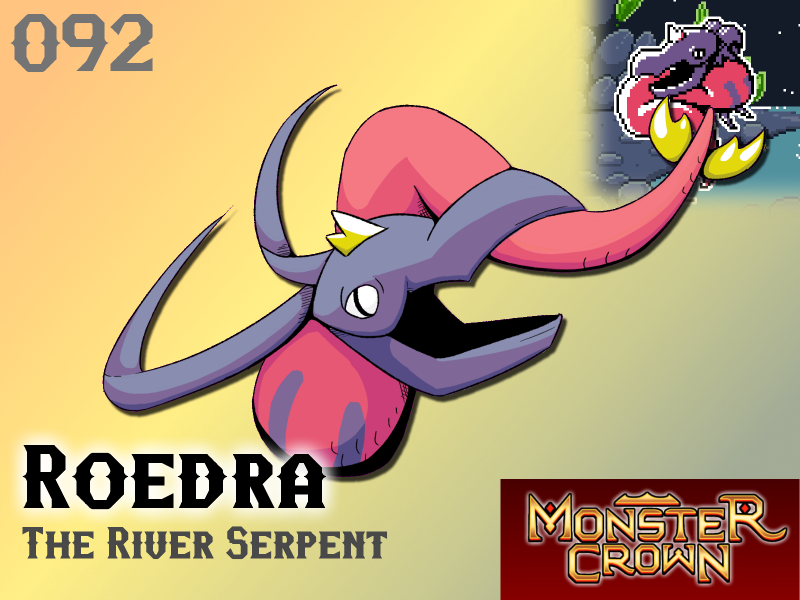 Deceptively built like a towering sea serpent, this small fry whips through the streams and rivers of Crown Island while snapping down on fish and dazzling those that it misses with a barrage of sparks. Roedra feed exclusively on fish, however, they find Humans, especially those they see as direct competition (for example, fishermen) as tremendous nuisances. It's not unusual to find these ankle-biters lunging at your feet or hissing from the rapids. Feeding on fatty, red fish Roedra generally don't pose much of a threat, however, in times of high humidity and thunderstorms an amazing phenomena occurs. Roedra becomes able to swim freely in water and air alike, creating a rude surprise for those that live near their territory. Luckily Roedra has a glaring weak point - hammering the horn on its head will forever render it unable to use electrical powers or leave the waters ever again. Will Roedra make your team? Hmm... totally has potential for my Team... especially if I can craft it a Hardhat for protecting its Head Horn.